For a summer garden full of breathtaking flowers without a lot of fuss, Lilies are the way to go. The Asiatic Hybrid Lilies, most of which grow about 2 feet tall, are the first to bloom, usually in late May to early July. 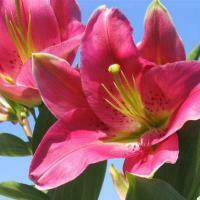 Lilies like a spot in full sun with rich, evenly moist, well-drained soil. Place in afternoon shade to protect from the heat and prolong the bloom. Oriental Lilies have wider leaves and a later bloom date than Asiatics from late July to early August. Orientals have 6-12 large, open faced blossoms on each stem in shades of pink, white, yellow or red and have a strong perfume. These are usually planted February through May. While we list an enormous variety of lilies, keep in mind that not all colors shown are available. Call in January/February to check availability.